Colin and Lee are different in every way. Colin is a tall, orange carrot, and Lee is a small round pea. Despite their many differences, can they still be friends? 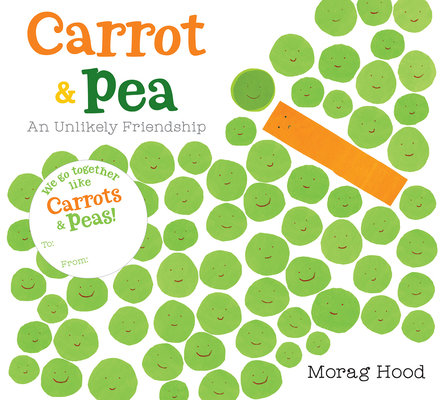 This delightful story about diversity and friendship is now in a board book edition. Colin is tall. He’s orange. He's a carrot! He’s nothing like Lee, a round green pea. He can’t do any of the things Lee and his pea pals can do. How can Colin and Lee ever be friends? A charming celebration of embracing differences and standing out in a crowd. * "In picture books, the message of embracing difference is, thankfully, a popular one, but it is Hood's dry humor as well as her illustrations, with their implicit message of turning throwaways into art, that make this story stand out. Wonderfully understated humor, thought-provoking illustrations, and a spot-on theme about the enriching nature of embracing differences combine to create a story that is much more than the sum of its parts." "While accessibly conveying the familiar, welcome theme of accepting and embracing differences, this playful, droll picture book might also provide an opportunity to explore different ways to be a friend." "Hood’s message will be clear to even the youngest readers, and the book is especially suitable for discussions about abilities and challenges."